Only two days until Conflux 2012! Along with our jam-packed schedule of talks, workshops, and screenings – we are excited that a few artists have also decided to do projects in public space that coincide with Conflux. Alex Young has decided to launch the Center for Utopian Socialist Studies Taxi Service and Academy during the Conflux Festival on Sunday, October 21st. Read Young’s text below to find out how to reserve your seat! Join the Welfare Island Speculation Platform (W.I.S.P) on Sunday, October 21st coinciding with the Conflux Festival 2012. 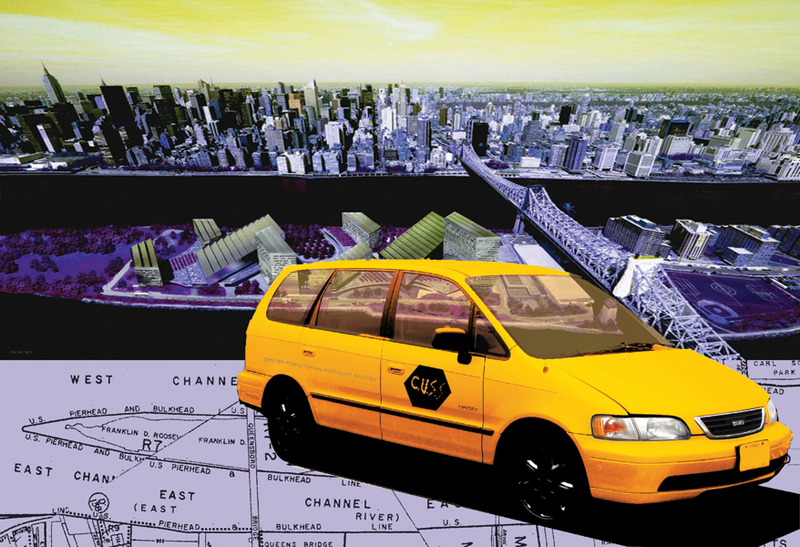 The Welfare Island Speculation Platform is a mobile research facility in the form of a taxi circling Roosevelt Island (formerly known as Welfare Island) in the vicinity of the Coler-Goldwater medical center. The center is slated to be demolished to make way for the new Cornell NYC Tech campus; a flagship institution in the resurgent attempt to establish a viable technological sector in New York City. Before the first girder is laid and before the first wrecking-ball is swung, the Center for Utopian Socialist Studies (C.U.S.S.) will pre-inaugurate the future site of this campus in the commons with the launch of the C.U.S.S. taxi service/academy. Passengers will consider the state of the city from within- exploring inevitable change, both technical and social and addressing not what now is, but what will soon be. Time: Sunday, October 21. RSVP to reserve your spot in the taxi. To reserve your seat and receive the pickup location, email info@worldshaving.info. Select pickups will occur on Sunday at 9AM, NOON, 3PM, and 6PM near Queens Plaza in Long Island City. You can also seek out the C.U.S.S. taxi on Roosevelt Island throughout the day. As seating is limited, locations for pickups will be provided in a confirmation email.